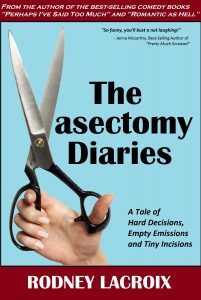 As I finish up my latest book, “The Vasectomy Diaries,” it’s time to start thinking of getting YOU involved! If you’d like a free ARC copy (PDF version) and have a website, blog or book review site, I’d love to hear your opinion! All you have to do is SIGN UP RIGHT HERE for the book blogging tour! Tentative date of release is late January/early February 2017 – so once you sign up, we’ll formalize review dates as it nears.